You’ve met Sergeant Sanda Greeve in our last preview. Now meet her brother Biran. 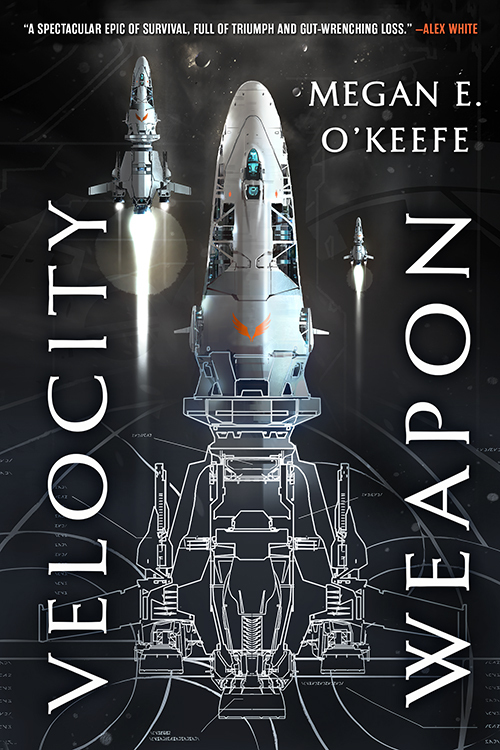 Velocity Weapon, is the first book in this epic space opera by award-winning author Megan O’Keefe. Look for it in stores and online this summer. The steps creaked alarmingly under Biran’s weight as he mounted the stage, but he would not let unstable footing delay the moment his whole life had built toward. News drones buzzed like loose wires above his head, their spotlights blinding him the moment he reached the podium. Keeper Li Shun clasped his hand in her strong fingers, the black robe of graduation transforming her from the stern teacher he’d known and admired into something otherworldly. She flashed him a smile—his sponsor for all these years—the hint of a silver tear in the corner of her eye. Pride. Biran’s chest swelled. Shun turned to the podium, bracing her hands against either side. The mic chain looped around her throat threw her voice out to the dozen graduating Keepers, and the thousands of Ada Prime citizens crowding the stands. Cheers exploded across the crowd, across the net. On massive screens suspended from drones, the faces of newscasters beamed excitedly as Biran watched himself, screen‑in‑screen, take the podium from Keeper Shun. His heart lurched, his palms sweat. It hadn’t been so bad, sitting in the crowd with his fellow graduating classmates, but now he was up here. Alone. Meant to represent them to all these people. Meant to speak to Prime citizens in other settlements, on other worlds. The first of the next generation—the vanguard of Prime knowledge. The notes for his speech waited in his wristpad; he could flick them open at any time. No one would mind. It was expected, really. He was only twenty-two, newly graduated. There wouldn’t even be whispers about it. But there’d be whispers about his hesitation. Biran took a deep breath, careful not to let the mic pick up the hiss of air, and gripped the sides of the podium. He sought familiar faces in the audience. Not his cohort— his family. Most of his cohort could rot, for all he cared. Over the years in training they’d grown into little more than petty social climbers, political vipers. Even Anaia, his childhood friend, had allied herself with the richest girl in the group—Lili—just to squeeze herself closer to the top. His fathers, Graham and Ilan, were out there in the crowd somewhere. Sanda, his sister, would watch from her gunship on her way to make a patrol sweep of Dralee. His family was what mattered. The hovering screens changed. The faces of the newscasters shifted from jubilant to fear-struck. Biran froze, terrified for an instant it was something he had done, or said, that caused that change. Later, he’d wish it had been. The newscasters were muted, but tickers scrolled across the bottoms of the screens: Battle Over the Moon Dralee. Ada Forces Pushed Back by Icarion. Casualties Expected. Casualties Confirmed. A newscaster’s face wiped away, replaced by the black field of space. Biran’s subconscious discerned the source of the video feed—a satellite in orbit around one of Belai’s other moons. The perspective was wide, the subjects pointillistic shapes of light upon the screen. Biran went cold. Numb. There was no way to identify the ships, no way to know which one his sister commanded, but deep in his marrow he knew. She’d been severed from him. One by one, those lights blinked out. Behind him, a teacher screamed. The stadium’s speakers crackled as someone overrode them, a voice he didn’t recognize—calm and mechanical, probably an AI—spoke. He took a moment to place the voice as the same used for alarm drills at school. Debris. Bits and pieces of Ada’s shattered ships rocketing through space toward their home station to sow destruction. Bits of soldiers, too. Maybe even Sanda, burning up like so much space dust in the thin membrane enclosing Keep Station. Things weren’t supposed to escalate like this. Icarion was weak. Trapped. The people of Prime, even on backwater Ada, were supported by empire. Icarion wouldn’t have dared . . . But they had. War. The stalemate had been called. The crowd rippled. As the warning voice droned on, the stadium’s lights dimmed to a bloodied red, white arrows lighting the way to impact shelters. One of the senior Keepers on the stage, Biran didn’t turn to see who, found their legs and stepped forward. A hand enclosed Biran’s shoulder. Not in congratulations, but in sympathy. Biran stepped back to the podium. “Calm,” he pleaded, and this time his voice did not crack, did not hesitate. It boomed across the whole of the stadium and drew the attention of those desperate for stability. The swelling riot subsided, the tides pushing against the edges of the stadium walls pulling back, contracting into orderly snake lines down the aisles. Biran took a step away from the podium. “Come,” Keeper Vladsen said. It took a moment for Biran to place the man. A member of the Protectorate, Vladsen rarely interacted with the students unless it was a formal affair. “There’s a Keeper shelter close by.” He gestured to a nearby door, a scant few meters from the stage that vibrated now to the beat of thousands of people fleeing. The rest of Biran’s cohort filed toward it, shepherded by Keeper Shun. Biran shrugged the guiding hand off his arm. His gaze tracked the crowd, wondering where his fathers might be, but landed on a knot of people clumped up by a stadium door. The drone ushers that handled the stadium’s crowd control gave fitful, pleading orders for organization. Orders the panicking humans ignored.